After a church service yesterday morning, I headed around the corner to Chelsea to take some snaps around the neutral streets. I recently found a faux fur hat that I had actually bought YEARS ago and lost. I have no idea how I misplaced the thing for so long, but thankfully it arrived back before the end of winter. 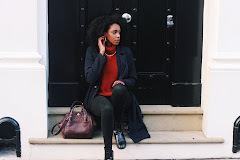 I love wearing neutral colours during winter time so I decided to pair it with one of my favourite cream turtle necks, this Zara handbag and darker staple pieces. I've always liked faux fur hats. In fact I've owned one or two in the past years but I never really liked the way they fit me. You've styled yours really well though, I love the look!